When baking or cooking common foods in your oven, it is important that the oven heats to the proper temperature. Otherwise, the food in your oven could become over- or undercooked. The electric ovens are able to be calibrated if only slightly off, however, if the temperature is 25 degrees off or more, you should replace the oven sensor. The oven sensor is the device in the oven the detects the temperature. The control board increases or decreases the oven temperature, depending on the oven sensor reading. Before calling a repair technician, attempt to calibrate your oven or change the oven sensor. An accurate oven tempuature is especially important when preparing baked goods such as bread. Turn on the oven and set the temperature to a medium-heat setting, such as 350 degrees. Allow the oven to preheat and then open the door and insert the oven thermometer. Allow the oven thermometer to remain in the oven for a few minutes and the look at the temperature reading, comparing it to the oven temperature setting. 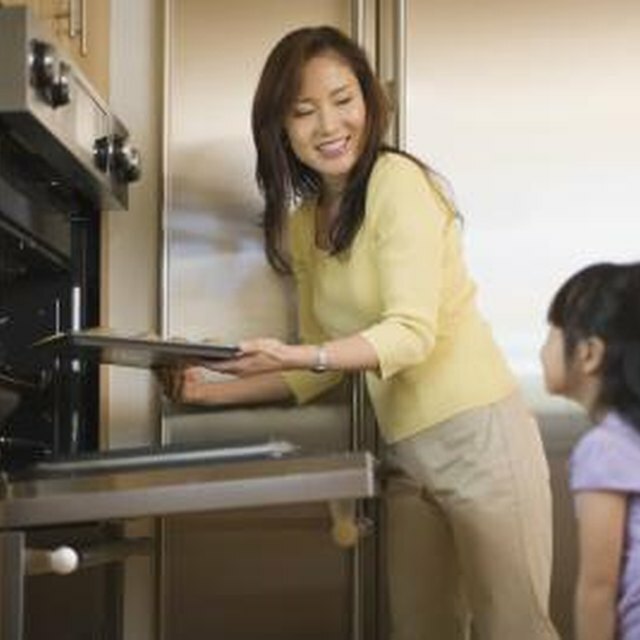 Recalibrate the oven if the temperature is only slightly off, or replace the oven sensor if the temperature is greatly off, such as 25 degrees or more. Turn off the oven to prior to calibrating. Press and hold the "Bake" button until the calibration settings are displayed on the display. Use the arrow buttons or "+" and "-" buttons to adjust the temperature the number of degrees that the oven is out of calibration. Press the "Start" button to save the calibration settings. Unplug the oven from the wall or cut the power to the oven in your breaker panel. Open the oven door and remove the oven racks. Locate the oven sensor, located at the top-center of the rear oven wall. Remove the mounting screw securing the oven sensor to the wall and then pull the oven sensor away from the wall. Remove the cable connected to the terminal on the rear of the oven sensor and then discard the oven sensor. Connect the cable to the terminal on the new oven sensor and then reposition the oven sensor and secure it using the mounting screw. Replace the oven racks and then restore power to the oven.